Medicine Ball – New Product! Use to the Medicine Ball to relieve inflammation and joint stiffness. 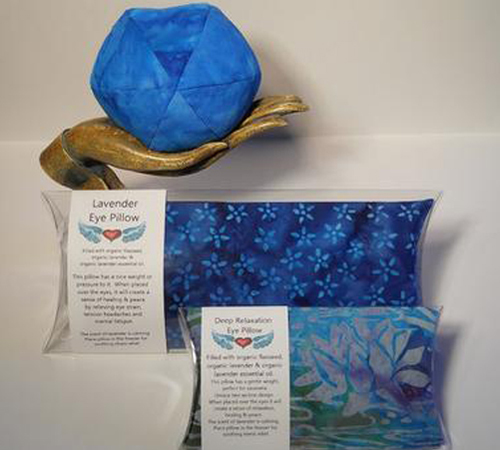 Filled with organic flaxseed, organic herbs and a soothing blend of essential oils. Massage with hands, roll on neck or roll under feet, use on shoulders, elbows or knees hot or cold. Available in a rainbow selection of batik fabrics. Comes in sealed bag with instructions. Many beautiful new Jewelry & Accessories arriving! Handmade accessories are truly art to wear! With an artist behind each piece, it is unique, fun and always beautiful. From the glitz and glamour of jewelry made from sterling silver, 14Kt. Gold, semi-precious stones, Austrian crystal, hand blown glass or pearls to the amazing colors and textures of fabric or leather handbags that are both beautiful and durable, you will find something you will enjoy for many years. We represent many nationally recognized jewelry designers such as: Patricia Locke, Deborah Richardson and Donnabeth Mitchell and handbags designed and made by well-known craftspeople like C.L. Whiting and Danny K.
Still looking for the perfect gifts for Christmas? We have some great new items! Visit us and you will discover fine American handcrafts that are unique, beautiful works of art for your home, office or to give as gifts that will be lasting treasures. Looking for some new home decor for your Beach House, Home, or Office? We have you covered! We are stocked with wall sculptures, sun catchers, hand painted glassware, wood carvings, blown glass, wine stoppers, nightlights and more are great to decorate at home or the office. Glass enameled wall pieces by Bovano or funky sun faces add dimension to any wall. Blown glass Witch’s balls or glistening starfish look great in any window. Timeless treasures for you or anyone on your gift list. We feature a wide variety of pottery including wheel-thrown, slab and hand-built functional pottery pieces of art. Our cookware is food-safe, microwave, dishwasher and oven safe. There are also one-of-a-kind pottery pieces or whimsical sculptures. We have new items arriving all the time so please stop in and see us at one of our stores in Duck or Corolla. Each year we select the best American crafts we can find. We search the country and choose items for their quality, function, style and value. We are always delighted to meet new craftsmen and enjoy representing them in our shops. We pay careful attention to details and represent the artist to our customers, providing information about the work to the customer. Shopping with us is a chance to find a unique item that is American made and has an artist and a story behind it. This year we have found many new artists from North Carolina, keeping our items as local as we can. We have also focused and being a greener company and supporting craftsmen who use recycled pieces in their work. It is amazing what people can reuse. Be sure to ask us about these items when you visit us or contact us. Reduce-Reuse-Recycle!